Osmosis provides everything students need to succeed in learning medicine. Built around evidence-based learning science research, Osmosis’s learning platform, study tools, and comprehensive materials help students stay organized, study more efficiently, and retain information longer. The comprehensive Osmosis Resource Library covers over 3,000 medical topics and includes more than 1,000 videos and over 27,000 board-style questions and flashcards. The personalized Osmosis Study Schedule helps students know exactly what and when to study for class and board exams. The Osmosis Quiz Builder allows students to create quizzes using both Osmosis flashcards and questions and their own materials. Osmosis’s built-in Spaced Repetition feature ensures that students review content exactly when they need to for deeper understanding and longer-term memory. Trusted by institutions across the globe, Osmosis is relied on by medical and allied health institutions such as University of Michigan, UCLA, Weill Cornell Medical College-Qatar, and the University of Arizona. In addition, Osmosis videos have almost 7 million video views per month, and the Osmosis learning platform is used by over 410,000 students worldwide. Osmosis is a toolkit for smarter studying. Access to over 1,000 videos including comprehensive coverage of pathology and physiology and growing collection of pharmacology and clinical reasoning topics. When students are about to forget something, Osmosis remembers. Osmosis sends flashcards on that topic to test and reinforce student understanding. Each Osmosis question and answer is carefully written and reviewed by health professionals, who have in-depth knowledge of how the boards expect exam-takers to think. Students plug in exam dates and the resources they want to use and Osmosis provides them with a study schedule that’s completely customized to their goals. 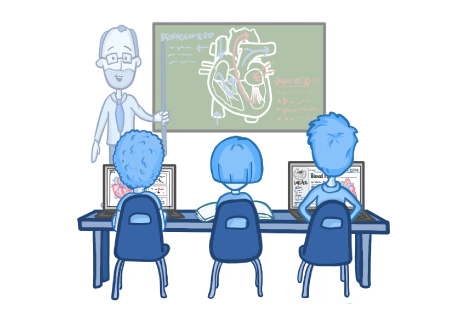 Find references to favorite study tools, like Picmonic and SketchyMedical, for a more seamless study experience. Students can study on-the-go with access to all of their downloaded flashcards and questions. 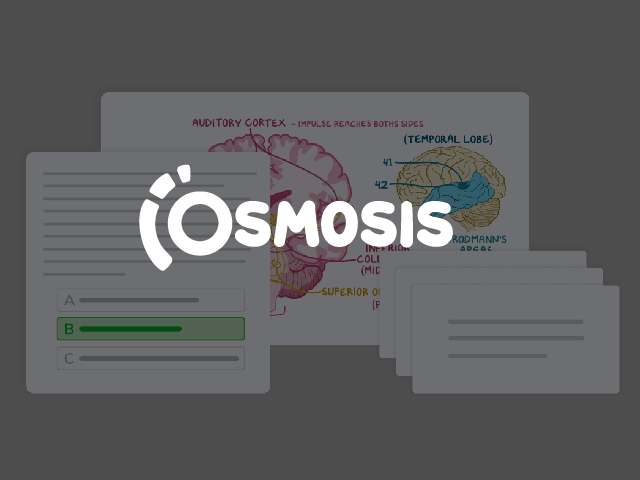 Osmosis Prime membership includes hundreds of videos, thousands of high-yield flashcards and questions, and a platform that supercharges the studying experience—all in one place. Osmosis Library is also a stand-alone purchase option. Directly in-line with the ACGME Core Competencies, Osmosis has a comprehensive video library with coverage of clinical reasoning topics and procedures. Also included is the Clinicians corner, where Osmosis’s team of current and future clinicians share their tips on professionalism and interpersonal and communication skills. With Osmosis's collaborative resources, residents can also create note cards and questions for each other. And, administrators can utilize the workspace to share journal articles for didactic and classroom discussions. Residents who are struggling in certain areas can be assigned specific videos and questions, serving as a useful, concise remediation tool. With Match Day in March and residents not beginning until July, Osmosis can be a tool provided by the program before residents begin as well as during their first year. Videos include important procedures like Central Line Placement, Intubation, and much more that can be reviewed over and over again for emphasis. Osmosis teaches faculty how today’s health professional students learn to become tomorrow’s health professionals. If you want to remain relevant as an educator—and have fun growing while you do—then I strongly encourage you to engage fully with the teaching and learning power of the Osmosis platform. Osmosis really provides a lot of memory hooks for you. You can choose to use all of Osmosis’s flashcards, all of your own flashcards, or you can mix the two. The base idea is that using spaced repetition everyday is creating your foundation. Osmosis allows me to devote more time to leadership positions and my personal life while maintaining my academics. To be honest, my grades have improved only 4-6%, but I am able to do this spending significantly less time than I was previously. And the lecture analysis feature is such a powerful tool that allows me to not just see generic information, but a study aid specifically for my class. It's the whole package! Osmosis is the best tool for staying organized and integrating classwork with high yield resources, all in one platform. The Osmosis Flashcards are not only extremely relevant, but they also feature cross-references to additional resources. These flashcards, in conjunction with the Osmosis spaced repetition method, have helped me to remember details that I studied from past semesters. I feel that it will help me be more prepared when I begin preparing for Step 1. As a non-traditional student, Osmosis has really helped me with streamlining my study time. I have other obligations outside of medical school, to include family and military commitments. I find that the best way to study is by creating questions and then practicing them over and over. The spaced repetition, particularly with the flash cards, also helps me in the days leading up to an exam. I utilized Anki for the first block of medical school but then decided to utilize the flashcard function in Osmosis. I find that it is more streamlined and I don't have to worry about syncing my devices. I have the Osmosis app downloaded on all my devices and use the flashcards/questions when I can't be in front of my computer. I've been able to significantly reduce the amount of study time I put in while still maintaining great scores, particularly in Anatomy. The questions and the links to First Aid are probably the most helpful. Osmosis is great for integrative learning and cutting down time on making study products! I love that it gives me the ability to annotate slides and create flash cards from slides that can be viewed from my phone.